SouthwestPaper stocks all common Basis Weights of Industrial Kraft Liner Boards. The number one use of Liner Board is the process of making corrugated boxes. SouthwestPaper will wind and sheet liner board for specific applications that require a much thicker piece of paper than your traditional light weight kraft paper. Some of the common uses are dust covers, interleaving sheets, floor protection, and wrapping. Liner Board is measured on a 1000 square foot scale. When comparing Basis Weight to light weight kraft paper, you must convert the basis weight to a 3000 square foot scale. You can do this by simply multiplying the basis weight by 3. 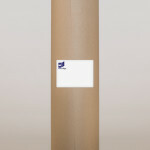 For example, a 33# Liner Board is equal to a 99# Kraft Paper.